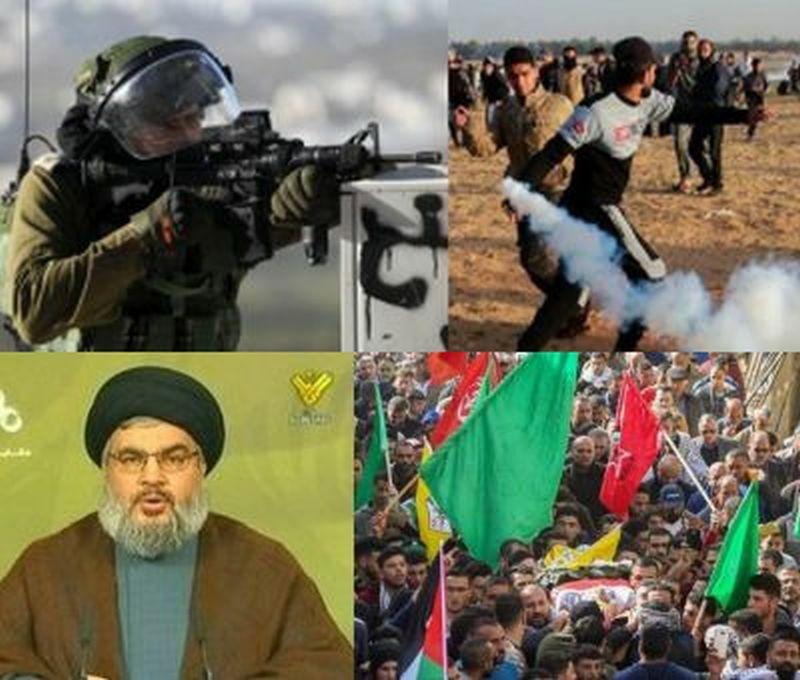 Hamas bulldozers leveled Gaza border ground, Nasrallah brandished his missiles, Palestinian extremists clashed with settlers and Iran switched to the “offensive,” as Israel’s April 9 election campaign got underway. On Monday, Jan. 28, the Palestinian extremist Hamas released photos of bulldozers clearing the ground along the Gaza-Israeli border to prepare for more of the mass riots that have plagued Israeli border forces for ten months. Its spokesmen moreover announced preparations to renew the incendiary balloon and glider attacks against Israeli border communities, as well as keeping up terrorist gang attempts to smash through the border. By this tactic, Hamas sought to show up as wasted effort Prime Minister Binyamin Netanyahu’s deal for channeling Qatar’s Gaza funding to humanitarian needs rather than the Hamas payroll. The Palestinian terrorists had managed to outmaneuver this deal. Hamas now controls the Qatari allocations, while retaining the option for escalating its cross-border attacks, in breach of its ceasefire bargain with Qatar. Indeed, there is nothing to stop Hamas from reverting to rocket attacks at any time it chooses. Hamas therefore holds a strong lever for disrupting the Likud and Netanyahu’s campaign for re-election by exercising its initiative for generating violence. Hizballah chief Hassan Nasrallah also laid claim to this lever when on Saturday, Jan. 26 he finally broke his silence over Israel’s November operation to destroy his cross-border tunnels. The Israeli minister Yuval Steinitz described Nasrallah as pale and faltering in this appearance and ex-chief of staff Gady Eisenkot insisted that every last tunnel had been destroyed or blocked. But the fact remains that the IDF cannot know absolutely that there are no tunnels left. And, moreover, there was no Israeli response to the key element in the Hizballah chief’s long harangue: an explicit threat to use his new precise missiles, stressing that he has enough of them, if he so decides, to strike every target in Israel. Nasrallah went on to arrogantly confirmed as true the allegations by Netanyahu and Eisenkot. that Hizballah had a scheme for capturing parts of Galilee. Tehran is also aware that Netanyahu and his party are fighting an election and is checking to see if threats can do some damage. On Sunday, Maj. Gen. Mohammad Bagheri, IRGC commander and Chief of Staff of Iran’s Armed Forces, threatened to switch from its “defense policy to offensive tactics” if its national interests came under threat. “We will attack first if we feel or see evidence that Iran may be under attack,” he said. An effort to spark a major headline-grabbing outbreaks to coincide with the election campaign was staged on Saturday in another combustible sector: Judea and Samaria. It led to a Palestinian death in the village of Mughayyer near Ramallah, which is also next door to the Israeli outpost of Adel Ad. The two clashed after an attempt to ambush of a settler. He survived what he was sure was a Palestinian kidnapping attempt with a stabbed arm and injuries from blows. A police probe seeks to establish who fired the fatal shot after the incident descended into mob violence. Cant wait for Israel’s enemies to make a mistake. "No" is the only response to terrorists at war with civilization. The terrorists and the antisemitic terrorist jihad “Charter” their people follow plus the fact that they are officially at war with Israel means Israel must pursue them until they give up and are defeated for good. The antisemtic squatters’ word means nothing (see UN 1701). ‘Civilization’ evidently means a colony of geriatric LOSERS living off welfare. Why do the civilization builders provide comfort women to ISIS in the Stolen Golan? Civilization and "words" are what make us human - the negation of civilization through jihad makes people inhuman. “Civilization” and “words” are what separates barbarians like jihadists and, apparently, you, from those who follow the Ten Commandments. “Civilization” is the reason you give for murdering a medic or using drone warfare on kids with kites! “The antisemtic squatters’ word means nothing (see UN 1701). ‘Civilization’ evidently means a colony of geriatric LOSERS living off welfare. As usual, your comments are totally devoid of any valid facts and make absolutely no sense what so ever. Once again, totally devoid of any valid facts and make absolutely no sense what so ever. I know it’s sort of a taboo to our people, but letting a piggie enter into your backside is a delight for which the torah should have allowed. I do it at least 3x a day. Dad and mom both show me how, all the time. how come you can post such a disgusting blog? I see here a continuity and escalation over decades of evil thoughts, threats, and actions directed to kill Jews. These came from people sick in their minds. All these people have only one element in common which is Islam. Am I wrong here to say that Islam is Antisemitism to its most virulent form? Such a nice regurgitation of everything you learned in Sunday school but take into consideration that the person whom you are apparently referring to was a Rabbi (a human being) with his own group of followers who publically referred to him as “king of the Jews” which resulted in his execution once Roman officials got wind of it and, in reality, the Rabbi Jesus has not been heard from since. ISRAEL’S ENEMIES ARE ON A DEATH WISH. One Huzbullah missile fired at Israel… one ISraeli missile fired at Iran. No longer can Iran hide behind proxiesI doubt Iranian citizens can stand being broke and being hammered by Israeli missiles as payback for far too long Iran has used proxies and denied they had anything to do with attacks. Now the messenges are sent direct to whom it may concern. Next time, when Iran shoots a missile towards Israel, the proper response should be for Israel to shoot one or two towards Iran. Oh yea, Iran is a target-rich country. And BTW, the missiles might be lunched from various locations other than Israel. Dear friends, stop your hair, peace will return to earth one day … when both sides are gone. “Dear friends, stop your hair, peace will return to earth one day … when both sides are gone. I’m not sure I understand at all what you mean by: “stop your hair”. Are you trying to compete with “Weak as a Spider’s web” to see who can produce the most illogical posts which just make no sense at all ????? If you’re aware of history at all, you must know that the rest of the world doesn’t exactly have a good track record for “calm and serenity”, as you put it. If you’re into some sort of “meditation”, it sure looks like you’re doing something wrong. So be strong and be prepared, for with a strong arm the children of Israel will fight back. BTW Purim is approaching on Adar2 read megillat esther and see what happened to Haman, may his name be erased. It will surely escalate very soon and it will bring a big war to the earth, the West and its allies will face the East . As in any War there will be no winner and the big military powers will lose their power. The world will be heavily dmages. No countries involved will be spared…but only the peaceful individuals of the Earth.